How can I give access to files in Box without users having to log in? Users can allow others to access files in Box without having to log in. Log into Box with UIC netID and password. Look up the file you wish to share. Click on Share from the option on the right side of the file name label. In the window that pops up under Access Type select People with the link from the drop down list. 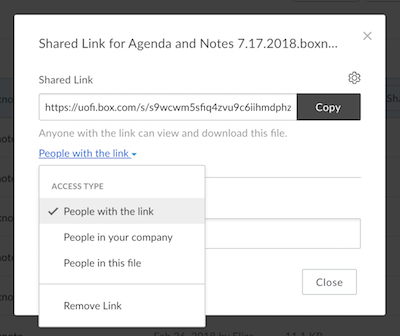 The link in the text box is the link that is shared with the other users.